Are you snowed up or snowed down or snowed under? I do not find any news from Middletown in any of the papers, although there seems to be all the other places in the State mentioned. I pray you are safe. No use to telegraph you for you would not get it. Went to rehearsal yesterday at 11. After Stage manager, prompter and the stage hands, no one was there but Mr. [EM] Holland and Mr. [Harry] Hogan and myself. The wind coming from the West made it very difficult for me to get back home, but I got here safe and have not been out since, as the theatre was closed last night, Mr. [James H] Stoddart not being able to get here from Rahway [New Jersey]. I guess he is here now, as I have been notified that we are to play tonight. Snow and sleet are falling fast, and I think our house will be slim. This is my tenth consecutive winter in the City, and this is by far the heaviest snow storm we have had. Even the elevated roads were compelled to stop running. 6th Ave surface cars not running yet. No news from you yet. Only news from Middletown this morning was the destruction of a church in a village near there. I wonder if you had to go to that. Mr. [James H] Stoddart left home on Monday 9 AM. In driving to the Station his wagon broke down, and he and his man had to mount the horses & get to the station. He remained in Rahway at the hotel until yesterday morning, when he came with a train of three engines and got to the City about 5 PM yesterday. He does not know how his man got home, and his people do not know anything about him. We closed Monday night, and Tuesday night Mr. [John] Findlay went on for Mr. Stoddart's part. The weather is getting a little warmer and the Sun did a little thawing today. I do not venture out, except to the theatre. Have not had news from Hattie since Monday 11 AM. You must have had a rough time of it, but I am glad it was no worse. I could not reach you by telegraph or mail, so had to wait. I imagined all sorts of things though. Well all our human greatness was put at a stand still in a few hours. We were quite as much cut off from the outside world as you were in your country town. It was dreadful. Provisions advanced in price. Coal rose 50 per cent. No milk to be had. The poor must have suffered dreadfully. But, "an ill winds that blows nobody good". Men had employment given them and it will be many days yet before they are idle, for the snow still lingers in the lap of Spring. I wrote you Friday and enclose $2. Will enclose a V in this. Hope your factory will be in working order again this week. 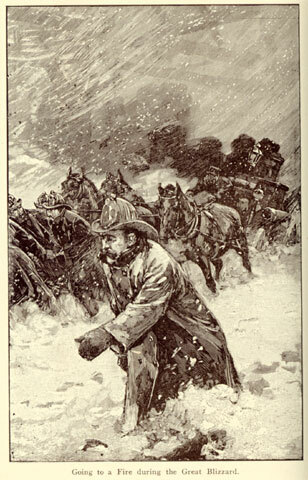 JH Stoddart writes of the blizzard in his memoirs. 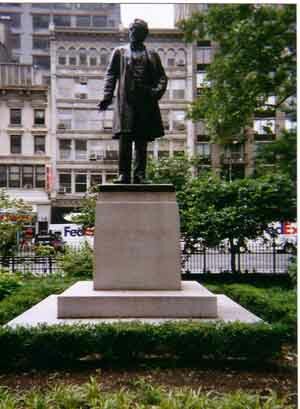 "We produced a very pretty play called Heart of Hearts at the Madison Square on January 16, 1888. I had a long and a very good part in it. I remember this play more vividly than any other of my experience for it was played in the year of the great blizzard. I expect we shall rehearse Jim [the Penman] next week, as we open with it in Boston next Wed'day. However I can get away from Monday rehearsal, if you think I had better stay all night and take 9 AM train on Monday. I do not mind taking the 7:20 train Sunday night as I shall be here before 11, and it is after that hour when I get home every night. The 23rd Street ferry is very convenient to this house. We leave for Boston on the 29th for five weeks. Get back 3rd of June. Today bought trunk for the trip -- $22, gloves for Jim and Partners $6.90. A pretty big hole in salary. Well half a loaf is better than none, and that is about what it amounts to. Snow in Boston was nearly three feet in January 2015 and nearly 60 inches by February – a record of more than 108 inches by March 16, before the winter was over . The ultimate total was 110.6 inches which did not melt until July. http://www.cnn.com/2015/07/15/us/boston-snow-pile-finally-melts/index.html While the winter of 2015 in Boston was very challenging, better weather forecasting, and equipment has kept electrical outages and deaths to a minimum. Deferred maintenance led to three days of the Boston subway being shut down. I’ve been grateful for electricity, snow plows and being able to work from home. Have been remembering the Feb 2013 blizzard Nemo (over two feet) I spent in Dallas with cousin Sally Harrison, unable to fly home for several days -- and cousin Brye and Elaine’s pre blizzard of 1978 wedding in Boston (up to 3 feet) when they and the bridesmaids spent nearly a week at Elaine’s house before being able to fly to their Aspen honeymoon. 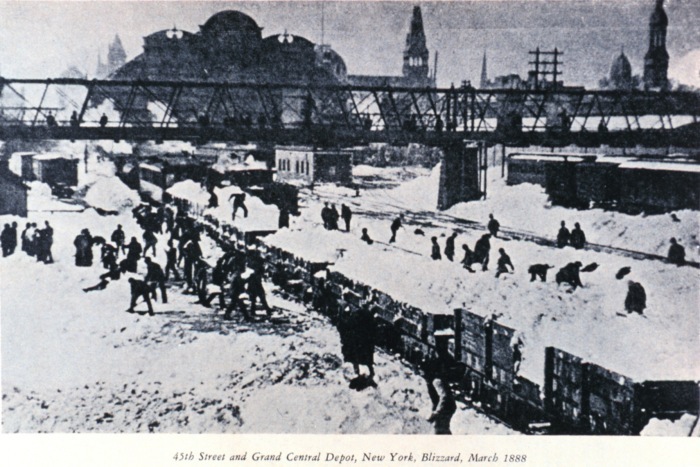 I've seen pictures of people lighting fires to melt snow after the Blizzard of 1888. Telephone, telegraph and electric poles were downed. Eventually New York put electric lines underground, but that took a number of years.